"I have driven school buses, sold egg rolls and painted houses, and I have often wondered what my life would have been like if I hadn't gone into acting. Mind you, it's a great life, going around pretending you're other people and getting paid ridiculous sums of money for it." John Gavin Malkovich (born December 9, 1953) is an Academy Award-nominated actor. 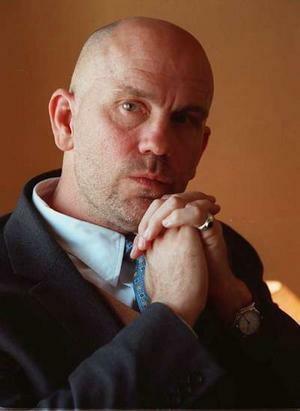 He is known for playing creepy psychopaths extremely well, and has appeared in films such as The Killing Fields, Empire of the Sun, Con Air, In the Line of Fire, and Being John Malkovich. Malkovich is a master of the Creepy Monotone, and can either be quietly understated or be a Large Ham of astronomical proportions. However, as with many great actors, he has appeared in some less-than-luminous films, including Eragon and Jonah Hex. He also appears in a cameo in Adaptation., As Himself during the filming of Being John Malkovich. He has now branched into the small screen, having played the infamous pirate Blackbeard in NBC's Crossbones and slated to guest star in the third season of Showtime's Billions. He is also the owner of a fairly popular restaurant in Lisbon, Portugal. Penguins of Madagascar (2015)— Dave the Octopus. Mile 22 (2018) — James Bishop / "Mother"
Awesome, Dear Boy: invoked Why he opts to make some questionable fantasy/sci-fi movies such as Eragon and Transformers: Dark of the Moon. Bald of Awesome / Bald of Evil: Since at least In the Line of Fire. "For a long time I played brooding, "James Dean" types. I was kind of relieved when my hair fell out and I didn't have to do that any more." Creepy Monotone / Evil Sounds Deep: His voice is tailor-made for those villainous roles. Cunning Linguist: He lived in France for years and is fluent in french. The Danza: invoked As the titular character in Being John Malkovich, he appears as John Horatio Malkovich, a fictionalized version of himself. Deadpan Snarker: His characters excel at withering insults and put-downs and dry remarks in general. Fake Nationality: invoked Played many Brits and Frenchmen in his career. Ham and Cheese: invoked Often remarked as the best part of his less prestigious work. Typecasting: invoked Weirdos, villains, or weird villains (exceptions include Empire of the Sun, The Man in the Iron Mask and Being John Malkovich-where the movie itself is the source of weirdness).